Portsmouth manager Harry Redknapp is taking the police to court over his arrest during an inquiry into alleged football corruption. Mr Redknapp, along with his wife Sandra, has lodged a legal action at the Administrative Court of the High Courts of Justice in London. They want a judicial review into a raid at their home in Sandbanks, Dorset. 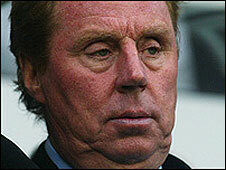 Mr Redknapp, who denies any wrongdoing, was arrested last November by City of London Police. A spokesman for the court confirmed that an action had been received and a first hearing will be held on 2 May. A City of London Police press officer said the force would not comment. Following his release on bail, Redknapp held a press conference in which he spoke of his "bitter disappointment" at the way the raid and his arrest had been handled. He complained that the police arrived at his home at 0600 accompanied by press photographers. Mr Redknapp was not available for comment today. Nine people are on bail in connection with the continuing inquiry.